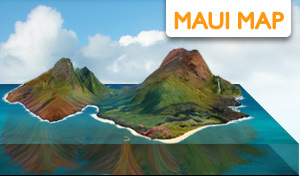 Here in the Hawai`ian Islands many people refer to the actual island of Hawai`i simply as the “Big Island”. And for good reason, the Big Island is the largest of the Hawaiian islands at 4,028 square miles, which is more real estate than all the other Hawaiian islands combined. It's also the youngest, geologically speaking, as the Kīlauea volcano has been erupting continuously since 1983, making the Big Island bigger every day. It is the southern-most island and the current home of Pele, the Hawaiian Goddess of fire, lightning, wind, and volcanoes. 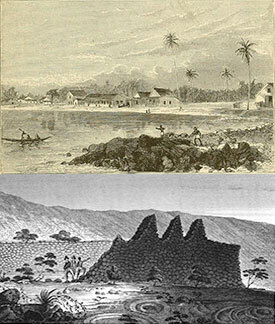 Hawaiʻi was the original home of Paiʻea Kamehameha, later known as King Kamehameha. Kamehameha united most of the Hawaiian islands by 1795, after many years of fierce battles and war. He ultimately named the chain of islands, now under his rule, after his home island; and called it, Hawai`i. In 1779, the European explorer who called the Hawaiian Islands the "Sandwich Islands", Captain James Cook, was killed at Kealakekua Bay on the Big Island. The video above was provided by Blue Hawaiian Helicopters. 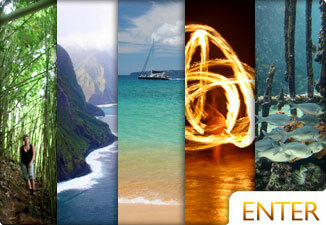 Check out their Circle of Fire and Waterfalls helicopter tour or call 1-800-786-2583. Mauna Kea is the worlds tallest mountain from the sea floor to it's peak at 33,100 ft ( 13,803 ft. above sea level). Kohala is the oldest of the 5 volcanoes on the Big Island (estimated at a million years old). 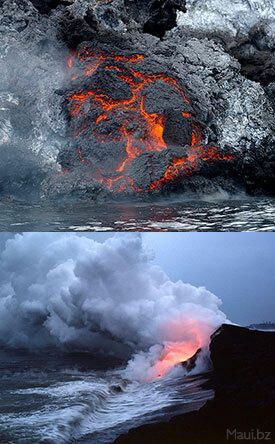 Compared with the other volcanoes on the island of Hawaiʻi, Hualalai is the 3rd tallest, 3rd oldest and 3rd most active. 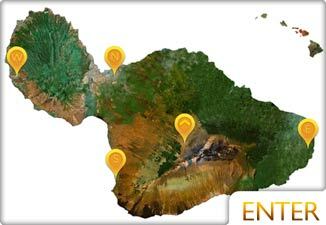 Due to the low amount of volcanic activity on Hualālai throughout the years there is a relative state of unpreparedness as evidenced from the hiking trails, tours and vacation resorts built nearby. Part of Hawaiʻi Volcanoes National Park, Kilauea is one of the most active volcanoes on Earth. The current eruption has been going on for 20 years and shows no sign of stopping. Off the southern coast of the Big Island, still underwater, Loihi has been erupting since 1996. in 250,000 years, we may be writing about the 9th island created from this volcano. 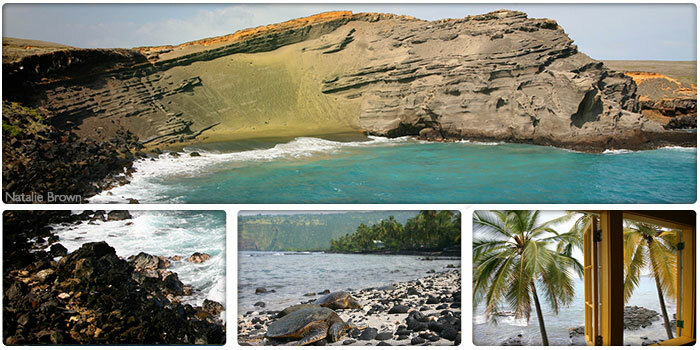 The green sand beach shown in the top picture on this page is something of a natural wonder. The minerals eroding from the high cliffs make a green hue on the beach. It's at the most southern point on the Big Island, and it's a long walk, unless you're a local. So, prepare to take some time hiking and bring a lot of water. When you leave, DON'T TAKE THE SAND! We know it's tempting, but don't do it. Bad juju. Kolekole means "raw or scarred" in Hawaiian. It's located just north of Hilo on the Hamakua Coast, a little jungle hideaway near the ocean. Kolekole Stream is nearby, as well as a small waterfall. Camping is allowed with a permit. Onekahakaha is popular with locals because it is shallow and has a sandy bottom. 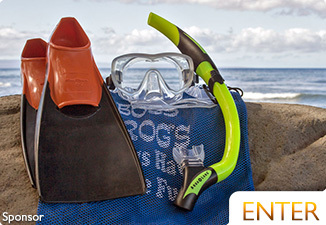 In other words, great for families, snorkeling and swimming. 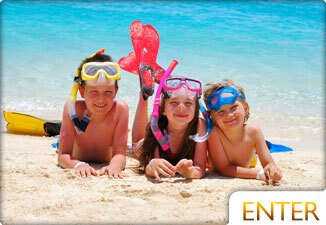 This shallow bay is a very popular snorkeling site. There are picnic pavilions, restrooms, parking and showers at the Ocean Center (not far from Onekahakaha Beach Park if crowded). 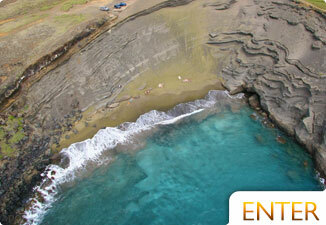 Famous for black sand and Honu (turtles), this beach has nearby camping and is popular with fishermen and families. Hawaii Volcanoes National Park is less than 30 miles away, in case you want to explore the area. Adjacent to the Waikoloa Beach Marriott (where you can rent watersports equipment) Anaehoomalu beach has plenty of parking, picnic facilities and restrooms. Next to the Hapuna Beach Prince Hotel, Hapuna Beach is the largest white sand beach on the Big Island. You'll find plenty of parking with a restroom and picnic facilities. Adjacent to the Fairmont Orchid Hawaii, this small beach park has facilities, but isn't a sandy beach. 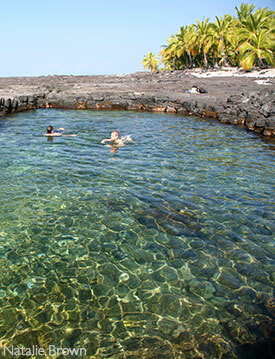 There are tide pools to explore and great snorkeling. Ancient Hawaiian petroglyphs can be found nearby at the Puako Petroglyph Archaeological Preserve. Voted among the Top 10 beaches in the U.S. by Conde Nast’s Traveler magazine, this is a unique half-moon shaped beach next to the Mauna Kea Beach Hotel. Parking is limited, so arrive early. Near the Historic Kailua Village (Kailua-Kona), Kahaluu Beach is known for frequent Honu (turtles) sightings and great snorkeling. Also known as “Disappearing Sands” or “Magic Sands” because tidal shifts and strong surf occasionally removes the sand from this beach temporarily. Near Kahaluu Beach and Historic Kailua Village, this popular beach is known for body- surfing and body-boarding. Facilities include restrooms, showers and a lifeguard, but parking is limited. This North Kohala beach is located about 30 minutes North of Historic Kailua Village; and is favored by families, because it is protected by an outer reef that produces calm swimming and snorkeling conditions on most days. Facilities include parking, picnic tables and barbecue grills. 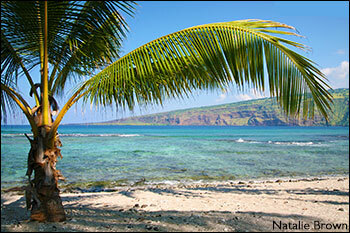 This beach is close to the Puukohola Heiau National Historic Site. Located on the east coast (wet side), Hilo is the capital and largest city on the Big Island. Most enter via the Kona International Airport (KOA). You can find Botanical Gardens and impressive waterfalls in and around Hilo. 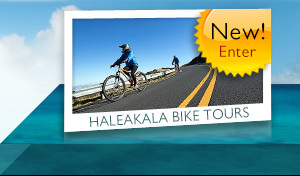 Kailua-Kona is the main town on the west coast (dry side), and is often referred to as simple, “Kona”. 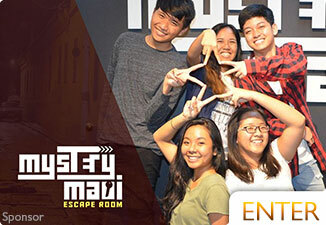 It has it's own airport (ITO) and is known to be more visitor-oriented than Hilo, and features mostly eateries, fancy shops and hotels that cater to tourism. Naalehu town is significant in that it is the southernmost town in the United States, further south than Key West by about 91 miles. Basically a ranch town on the northern part of the Island, Waimea is the center for ranching and paniolo culture. The Parker Ranch is the largest privately owned cattle ranch in the US, and hosts the annual 4th of July rodeo. If you find your way to the North Kohala coast, you must check out the little town of Hawi which is "choke" full of Art galleries, boutiques and tiny restaurants in quaint little buildings. Your welcome! This is a massive island, so we recommend that you rent a car. Pay attention, use caution and commonsense as this island is an extreme adventurer's dream filled with potentially hazardous natural wonders.